Earlier this year, I discovered Super Grammar. 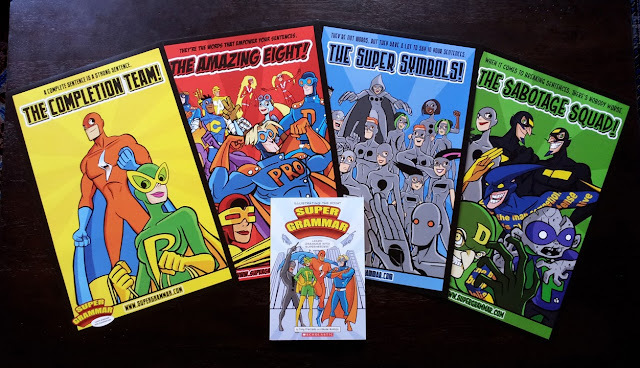 It's a fun guide for teaching your kids about grammar using a superhero theme that engages readers and describes all those pesky grammar rules in a way that most kids can understand. It was written and illustrated by two Latino illustrators: Tony Preciado and Rhode Montijo. In an interview, Tony told me that he wondered, “Why was English grammar so hard for me when I was a kid in grade school?” I suspect that a lot of us feel that way, especially those of us - and our kids - who are visual learners. I encourage you to read my full review of the book and how I've been using it to teach my own kids grammar. They absolutely love it. It is an EXCELLENT tool for both teachers and parents whose students/children are struggling to understand all the tedious grammar rules. Honestly? Kids of ANY age (and maybe some of you parents, like me!) will benefit from reading this book. TWO (2) lucky MommyMaestra readers will receive a Super Grammar set that includes the book, plus four posters that feature the four Super Teams, like the Completion Team that is made up of The Subject and The Predicate who must work together to form a complete sentence. This looks amazing! I think I might even be able to get the boys interested in grammar! You are having some awesome giveaways! We checked it out from our library - my daughter thought it would be a good idea to get a copy of our own. How lovely it would be to get selected! This looks like fun - not a word we usually associate with grammar! I think my kids would be into it. Grammar can be tricky. This looks like a fun way to learn about it. Fun, fun fun. that is what we need. Thank you maestra! This looks really great! I think the boys (and I!) will benefit from these! Thank you for the chance! I'm crossing my fingers! As an ELA/Reading teacher this is perfect for me! I love Super Grammar! Thank you for this giveaway. I teach high school and my older students love it! I am loving this Super Grammar Program. The theme in my class this year is Super Heroes, so this is perfect!!! As a new homeschooling family, this set would be a great addition to our library! This would be great for my boys! !